This year, Carers Week takes place from Monday 11 to Sunday 17 June with the focus on ‘helping carers to be healthy and connected’. 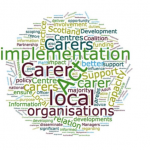 With the implementation of the Carers (Scotland) Act 2016 in April 2018, local authorities are required to publish local eligibility criteria outlining the levels of support carers can expect. 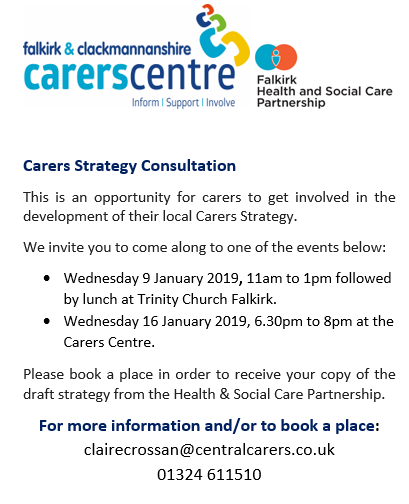 This is another opportunity for carers in Falkirk, who were unable to attend the December event at the Park Hotel to participate in the co-design of local eligibility criteria, to join us for an evening meeting on Thursday 15 February, 6 pm to 7.30 pm at the Carers Centre. The meeting will include an update on the Carers (Scotland) Act 2016 and the opportunity to be involved with partners in health and social care to determine how the needs of local carers will be met in the future. If you would like more information or to book a place, please contact the Centre. For more information on Falkirk Carers Eligibility Criteria 2018 consultation click here. Please note that the Carers Act Evening Event to be held on Wednesday 10 January 2018 has been rescheduled to Thursday 15 February 2018, 6 pm to 7.30 pm at the Carers Centre, 1a Bank Street, Falkirk FK1 1NB. With the implementation of the Carers (Scotland) Act 2016 in April 2018, Local Authorities are required to publish local eligibility criteria outlining the levels of support carers can expect. 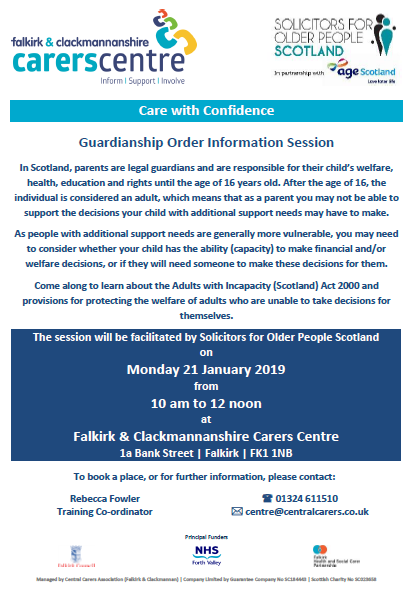 Carers in Falkirk who were unable to attend the December event at the Park Hotel to involve carers in the design of the eligibility criteria are invited to attend this event in February. The meeting will include an update on the Carers (Scotland) Act 2016 and the opportunity to be involved with partners in health and social care to determine how the needs of local carers will be met in the future. This is an opportunity for those who were unable to attend our last Falkirk Carers Forum and participate in the co-design of local eligibility criteria to join us for an evening meeting on Wednesday 10 January 2018, 6 pm to 7.30 pm at the Carers Centre, 1a Bank Street, Falkirk FK1 1NB. Falkirk Health and Social Care Partnership (HSCP) is seeking to recruit two carer representatives to the Integration Joint Board (IJB), with one as the lead and the other as a substitute. Two further drop-in sessions are being held for anyone interested to ask questions and learn more about the positions. To view the Carer Representative Role Remit, please click here or contact the Carers Centre. Please join us at the Clackmannanshire Carers Act Event, 10 am to 12 noon or 2 pm to 4 pm with lunch available from 12 noon – 2 pm on Friday 8 December 2017 at the Municipal Buildings, Stirling. This event is an opportunity to discuss pathways to accessing support, information/advice for carers, eligibility criteria, what works well now, what gaps exist, and consideration of other models of support.